Whether structured or flowing, we have the right fabric decor for your event needs. Our tension fabric decor items bring a modern element to an event space. We believe everything should be tailored to your specific event theme and allow you to customize the fabric color and pattern as well as brand any decor items. 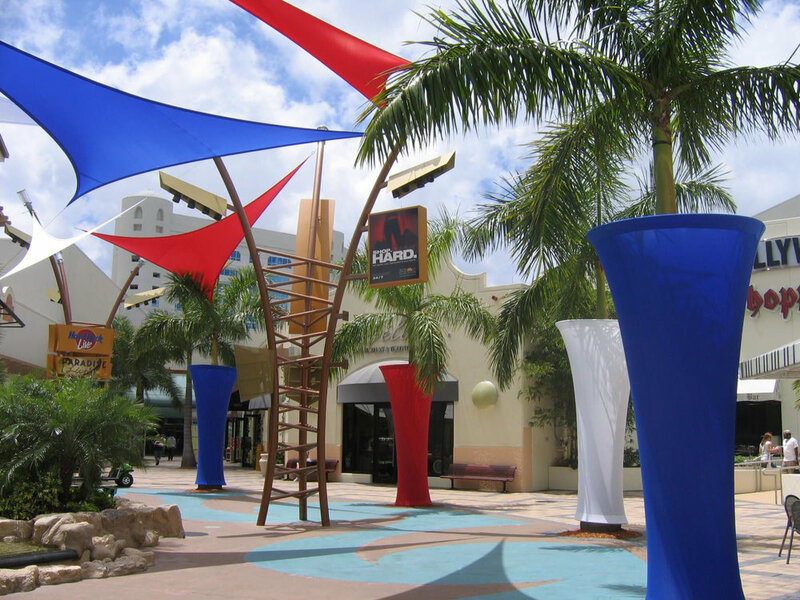 All of our stylized palm trees, wave walls, ribbon walls, oversized lamps and spandex sails come in multiple heights and overall dimensions to accommodate the venue and your event vision. Contact us to receive the full list of fabric products, colors, and dimensions. Scenic Elementz is a full-service event production and design company in South Florida providing exceptional service and a quality product. We refuse to sacrifice excellence. We create a superior end product with meticulous attention to our clients’ needs, creative imagination, and polished execution. It is our goal to create an end product that we can be proud of and to make each client a repeat customer.